BT, together with UK tech start-up Coderus, today revealed a tactical app which will act as a virtual ‘seventh crew member’ to help Ben Ainslie’s Land Rover BAR team gain a competitive edge in their bid to win the 35th America’s Cup this summer. Over the past 12 months, the bespoke app has been designed and tested with the help of mobile app experts Coderus, who are based at Adastral Park, home of the BT Labs, as part of the Innovation Martlesham cluster of start-ups. 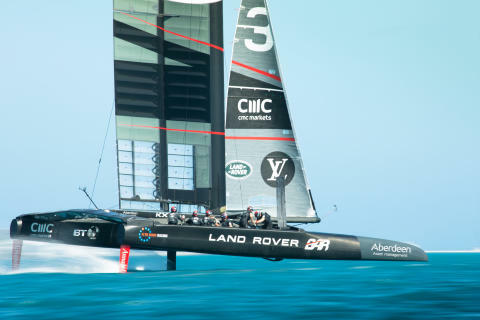 BT, part of the Land Rover BAR Technical Innovation Group, which is chaired by the management and technology consultancy PA Consulting Group, committed to help the team after the number of crew members allowed on board the catamaran shrunk from eight to six after the last America’s Cup. This means that helmsman Sir Ben Ainslie, and tactician Giles Scott, have more responsibilities and less time than ever before. BT and Coderus needed to develop an app for use on mobile and wearable tech which could intuitively show critical information throughout the race, with no user interaction. It was also essential that the software was well crafted so its operation kept pace with events as they unfolded, as well as being optimised for robust network, hardware and battery performance, given the length of time that the crew spend on the water. After a series of “agile development sprints” and testing sessions over the past 12 months with Ainslie, Scott, engineers from the team and user experience architects from BT and Coderus, the new app has been designed to provide critical data to the team about the strategic layout of the course, the position of the boat, how many legs of the race are left and how far it is to the next boundary, all allowing the team to make swift tactical decisions and giving them maximum time for manoeuvring. The app can also tell the team exactly when to power up so that they cross the start line at the second the race begins, gaining a critical advantage from the very beginning by getting the team in front at Mark 1. The leader at this point is expected to win up to 80% of the races for the America’s Cup. The technology works both on a tablet screen and a smart watch, so that the crew members can be alerted to glance down and see vital information about the sailing course instantly. The team will be using high water-resistant Android tablets and watches. During training sessions the technology, along with hundreds of sensors on the boat and voice communications, is all connected back to the shore via BT’s military grade 4G wireless link, and back to experts at the team’s Portsmouth base via a subsea cable, part of BT’s global communications network. This is part of the agreement recently announced by the two companies, with BT working as Land Rover BAR’s Technology in Sustainability partner. The app will be used in a competitive race for the first time on the 26th May as part of the America’s Cup Finals in Bermuda. During races the app runs on its own, with no connection back to shore. As exclusive broadcast partner for the UK and Ireland, BT is bringing live footage of the competition to millions of people at home. BT will show the 35th America’s Cup on BT Sport this summer, broadcasting live coverage through to the finals in Bermuda. For the year ended 31 March 20161, BT Group’s reported revenue was £19,012m with reported profit before taxation of £2,907m. 1The results for the period have been revised to reflect the outcome of the investigation into our Italian business. Detail of which is set out in our third quarter results announcement published on 27 January 2017. This financial information is unaudited. Coderus Limited is an innovative software development and consultancy company based in the UK but working across the globe.They pride themselves on close collaboration with clients to understand their current and future business needs.They build software with this in mind, because technology trends change so rapidly, so adopting the most appropriate design, tools and technologies at the outset is crucial. The experience and depth of capability of those working for Coderus allows them to deliver solutions from a software application to a fully featured cross platform end-to-end design based on detailed customer requirements. Every project is professionally managed and delivered using world-class development and planning tools to ensure timely and cost effective delivery.They use industry standard project delivery techniques, including an agile delivery approach if appropriate. In all cases, Coderus assures that the user interface design, coding and platform features will have all been fully optimised to deliver a complete package with the best possible usability and customer performance.